This page features a growing collection of printable city and street maps of the United Kingdom. Shown here (so far) are a London street map, a map of the city of Dublin (Ireland), and a two-piece map of Scotland. 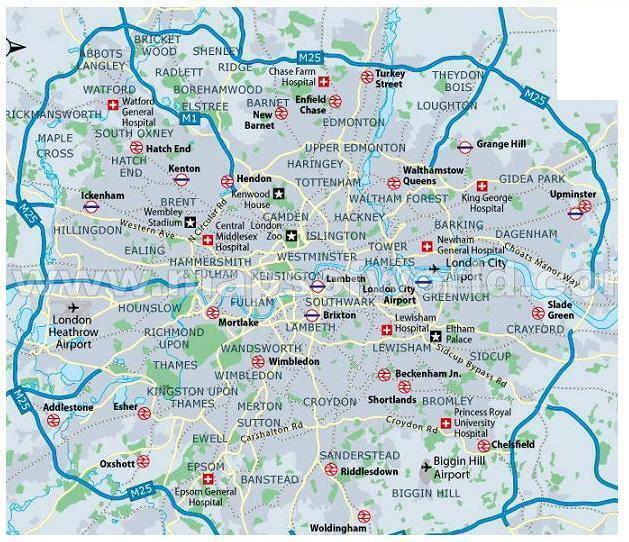 The map shown above depicts the Greater London area. Situated along the River Thames, the region known as Greater London is the largest city in the United Kingdom. Greater London has a population of more than 7 million people. At the center of Greater London is the City of London. The city of London has more international visitors than any other city in the world. London is home to 43 Universities. 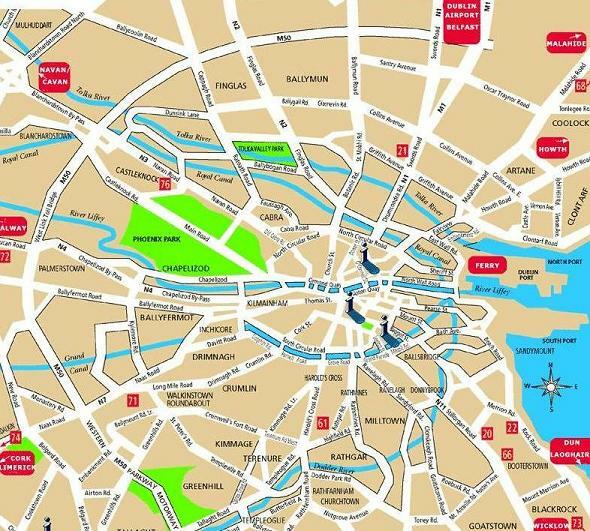 The map shown above depicts the city of Dublin, the Capital of Ireland. Dublin is located on Ireland's eastern coast, across the River Liffey from England. Dublin is home to three Universities, as well as the Dublin Institute of Technology. Dublin's iconic landmarks include the Ha'penny Bridge, the Spire of Dublin, Christ Church Cathedral, St. Patrick's Cathedral, and Trinity College. 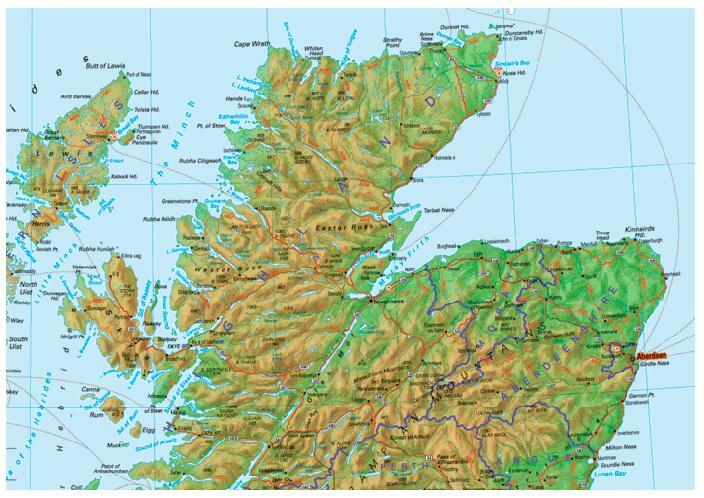 Shown below is a map of Scotland. Scotland has a resident population of about 5.3 million. More than ten percent of them live in Glasgow. Edinburgh is the Capital (and second largest city) in Scotland. To print any of the maps shown above, just right click on any image and select a SAVE option from your drop down menu. When the image is saved to your picture file, enlarge it for better readability. The United Kingdom (more commonly known as "the UK") is an island located near the northwestern coast of mainland Europe. Countries considered part of the UK are England, Ireland, Scotland and Wales, with London as its Capital. The UK's total land area is about 245,000 square kilometers, or 94,600 square miles. England comprises more than half the land area of the whole United Kingdom. 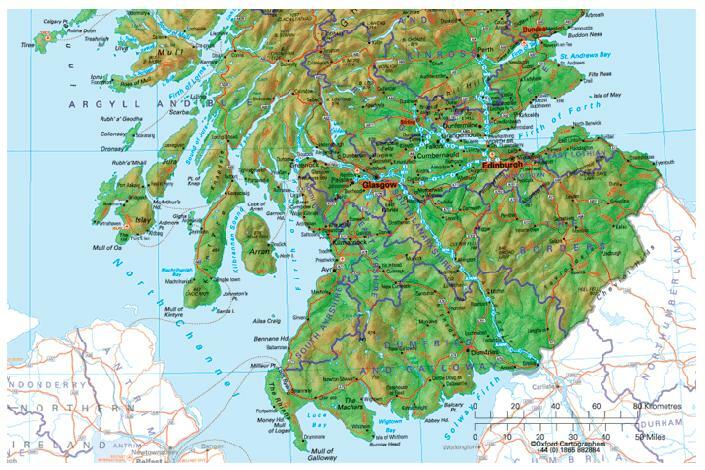 Check back often for more printable UK maps. Go here to see the Main Maps Page.